The making of horse nails is a good exercise while learning the elementary steps in forging. Get a nail- rod 3/16 x 1/2 inch Swedish iron or mild steel. 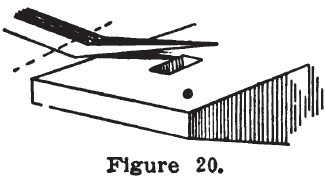 Point the rod, or draw out the nail to the length desired. Then place the rod edgewise on the anvil, with the rod over the inside edge of the anvil. Now strike with the hammer in such a manner that the face of the hammer, with its center, hits over the edge of the anvil, thus making a shoulder for the head. See A, Fig. 19. Then place the nail over the hardie where the dotted line indicates, and cut off. B, Fig. 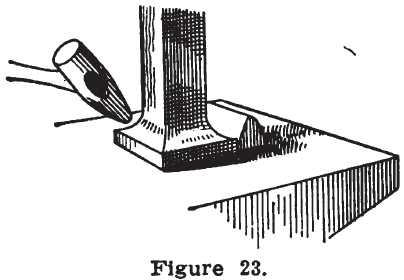 19, is another kind of nail, called the “calk nail.” This nail is made in the same manner as nail A, and when the head is forged the nail is placed on the anvil as shown in Fig. 20, and the point bent back. When this nail is cut off as indicated by the dotted line in Fig. 19, it will make a diamond shaped head, which will act as a calk. When the calks on the shoe get dull, a couple of nails can.be pulled out, and a few of these calk nails driven in, and the horse is sharp-shod again. Take a 1 1/4-inch square bar of tool steel, – not mild steel,—and punch a hole three inches from the end. The punch for the punching of the hole should be made of 1 1/4 x 1/2 tool steel, pointed to the size of 3/4 x 3/8 on the end. In punching the bar, you will find that the punch is liable to upset and stick in the steel. To prevent this, place a little cinder or a coal the size of a bean in the hole, and the punch will not stick. When the punch has penetrated far enough to make a mark on the opposite side, turn the steel over, and punch from that side. 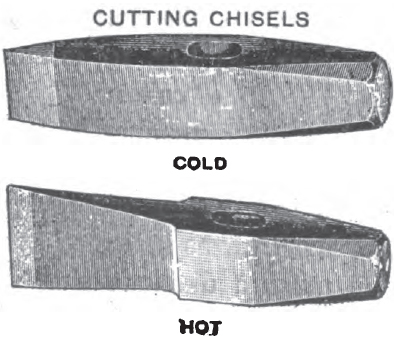 This done, put the bottom fuller in the hole of the anvil, and place the steel over, so that the inside of the fuller is about half an inch from the bottom side of the hole in the chisel, and the top fuller right over it. Now make a groove all around, as shown in Fig. 21. 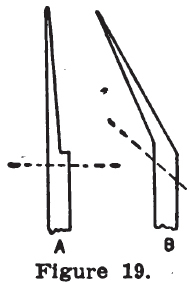 This done, draw out as indicated by the lines, to make a hot chisel. For a cold chisel, let that be a little heavier all through from the edge down. Next cut off and draw the head down a little, as indicated by dotted lines. Harden and draw the temper to a blue hue for cold chisel, and with a shade of coffee color for a hot chisel. In making hammers and punches, we start by making the eye. First punch with a punch 3/8 x 1 1/4, tapered to about 3/8 x 7/8 after the hole is started. Have an oval punch the size of the hole. Drive this into the middle of the punch. Then fuller out as shown in No. I, Fig. 22. Next place the eye of the hammer made over the bottom fuller, with the top fuller on the top side, and fuller out as shown in No. 2, Fig. 22. This leaves the forging like No. 3 after the eye is rounded off. Now, if you want the hammer round over the eye, place the punch in the eye when the hammer is hot, and upset against the anvil; then smooth off with a small flat hammer,—not the set hammer, as new beginners do. 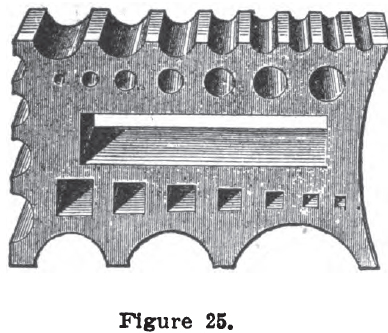 The set hammer has a square face and corners, and is not fit to use in forging. Next draw out the pene as shown in No. 4, and round up the face. When finished, harden the face end first to a yellow straw color, about to shift to a coffee color. The pene should be drawn to a blue color. In heating the pene, place a wet rag around the face end of the hammer, if you think it is hot enough to draw the temper. In making flatters, upset the end of the steel until it is flared out to the size wanted. The material for the flatter must be not less than two and one-half inches square tool steel, and the face should be from three to four inches, according to the size wanted. 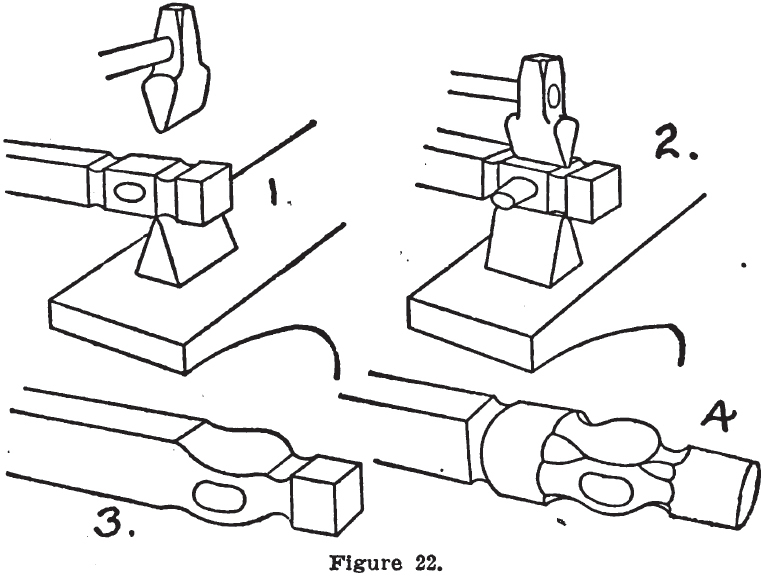 After the end has been upset, place the bar on the anvil, face of the flatter against the anvil, one side resting against the bottom fuller, so that it cannot slide off the anvil, and then use the fuller— not the set hammer—to shape the flanged face. See Fig. 23. I cannot too often warn against the use of the set hammer. It is a tool too much used where it should not be. 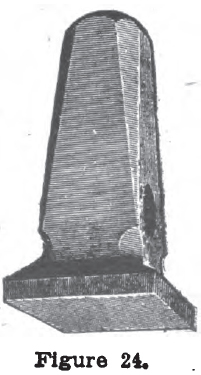 Some smiths will take the flatter at this stage in the making, and place the bar in the square hole in the swage block, and strike on the face end with the sledge. In so doing, you will forge a sharp cut into the steel, and make the foot a square angle. This is neither a strong nor a good-looking flatter. When the flatter is finished, it should be like Fig. 24. The flatter should not be hardened, nor the head of any tools like chisels, set hammers, flatters, and any tool on which we strike. The swage block is a very handy tool, and every smith should have one, for it answers for swages and head tools both. See Fig. 25.